Silver rings with lead wires over a shaft are inserted in a transfer or compression mold. The plastic material (usually conforming to Mil-I-14) thermosetting or an epoxy type is injected into the mold. Pictured is the Gen-500 general purpose Slip Ring and Brush Assembly. 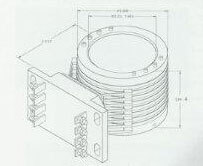 Danmar Industries offers this unit to the designers who prefer to custom build their own bearing mounted Slip Ring assemblies, and for applications where a completely encased unit is impractical. Gen-500 Slip Ring assemblies can adapt to any shaft up to 2.250 inches in diameter.